We’ll probably never find out what it’s like to attend a real life rodeo unless it somehow becomes oddly popular in the UK but that’s no problem because we can experience the next best thing with this online slot machine from Genii; it’s called Buckin’ Broncos and it’s a photo-realistic game with a free spins round – read on to find out more. 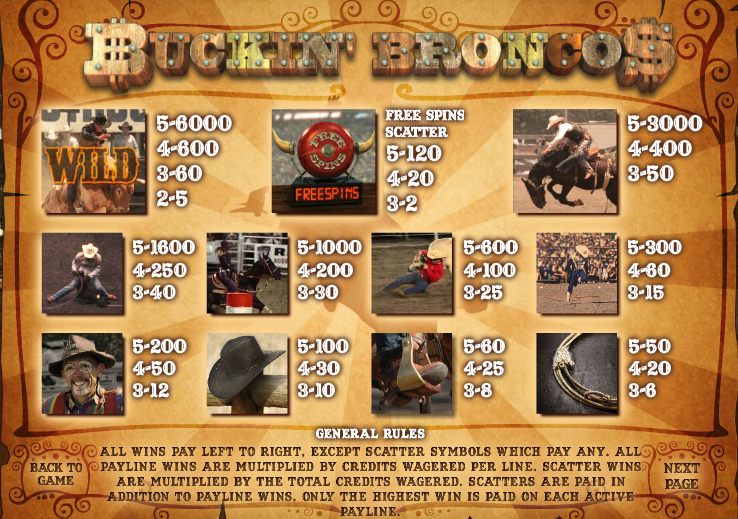 Buckin’ Broncos is a five reel slot with three rows and forty fixed paylines; those reels are housed within a metallic frame which itself is bordered with spurs and lengths of rope; in the background is the stadium in which all the action takes place. The five highest value symbols are all action shots featuring cowboys, horses, cows and various combinations of those items; there’s also the rodeo clown, a Stetson hat, a boot in a stirrup and a lasso. The wild symbol is another action shot with ‘Wild’ stamped across the front and it will replace all others to help form winning combinations except for the scattered free spins bell. Three Bells – 7 free spins + 2x multiplier. Four Bells – 14 free spins + 8x multiplier. Five Bells – 21 free spins + 4x multiplier. The spins will start as soon as they’re triggered so if you wanted to go and make yourself a coffee before enjoying the free action, you can’t. It’s also not possible to trigger any more spins from within this feature. 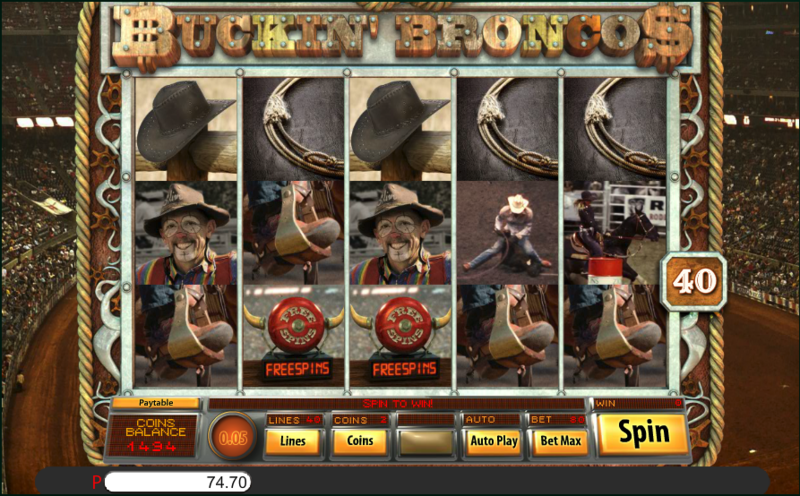 Buckin’ Broncos is a slot which is notable for its unusual theme and real-life symbols; there’s some cowboy music to accompany your gameplay and a regularly triggered feature to (hopefully) keep the spins rolling in.